Lately we've returned to the rollercoaster of rages and calmness and I've no idea what the triggers may be. 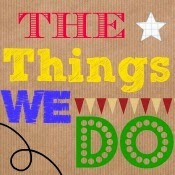 One recent episode arose from me putting money in Missy's moneybox which had been lying around on her bedroom floor. As I was crouched down, she thumped me hard on the back and it bloody hurt. The rage lasted 10 minutes then it was over, quickly as it started. Another because, following a two minute fringe cut at the hairdressers, she wasn't offered a lollipop by the stylist as she often is. Outside the salon her face had anger and disappointment written all over it. I empathised and showed her I understood why but her volume in the car was turned up max and continued back in the house. I offered her something at home but it wasn't good enough and the rage lasted another 10 minutes before she was distracted by her crochet. My Mum showed her how to crochet a few weekends ago, starting with a simple stitch and a chain. By Sunday she had, all by herself (because I have no clue) knitted a small hat fit for a doll complete with bobble on top! 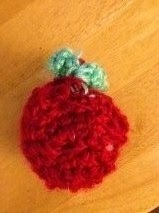 This week she wanted to crochet her own pin cushion in the shape of an apple. Up until yesterday morning she'd happily been crocheting an ever-expanding circle of red wool then I came back from the gym (#takingcare) and an apple shaped appeared before me. She stuffed it and closed it up all by herself plus crocheted small green leaves on top. I was pretty much speechless, gobsmacked. This talent for crochet is one thing sure to keep her calm and engaged. It also shows me she is able to think about things, find a solution and execute it - because believe me I'd have no idea how to have crocheted that apple, let alone the leaves and attach them. We need to seriously nurture this talent and think how school can also use this creative strength. Back in November the GP referred us to CAMHS after I talked to her about my anxiety and Missy's behaviour. Two weeks ago the appointment came through and we are seeing them soon. I've no idea what to expect at the first appointment and sometimes I think, when Missy is laughing, loving, singing Gold at the top of her voice in the car and doing her crochet, that I'm over-reacting, but after a lovely chat with a man from the NHS who phoned for the initial triage, I realised that, no, I am not. He took Missy's behaviour very seriously and I wanted to give him a massive hug. Just having the chat with this man helped. So, we shall see what the appointment brings, if anything. I read so much from others that CAMHS are as useful as a chocolate teapot but I'll reserve judgement until we've seen them. 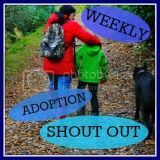 I've had a break recently from the usual parenting books and have been reading autobiographies (the Kemps, who else! - the concert was brilliant by the way) but today I'm back on the parenting book "Why Can't My Child Behave" by Dr Amber Elliott. I like this one because in so many ways it is describing Missy and I can relate to many of the case histories. I ploughed through quite a lot this morning and have bookmarked many pages to highlight to Daddy later on. This book in particular explains a lot of why a child might be behaving in this way which is so helpful in relation to their background - some things I understand but others ideas I hadn't considered as yet. Daddy and I need to revisit some of the strategies we have learnt over the last couple of years and also put into practice some of the ideas from this book. Unfortunately we've been guilty of using too much reward-punishment stuff lately. In other news, physio is definitely helping my hip and I'm feeling quite excited at the thought of running again (I really want to a do a triathlon, though it probably doesn't help that I sold my bike). In the garden, the potatoes are in, the tomatoes are coming up and I've planned the seeds to be sown. OK, back to the book and planning for the forthcoming Easter holidays. Did someone mention chocolate? There is a lovely interview in today's Guardian with Clare Grogan who, for the younger readers, is most well known as the lead singer of 80s pop group Altered Images and star of the film 'Gregory's Girl'. I'd read quite some time ago that she was an adopter and the article today talks about the books she has written for her adopted daughter. There is a quote in the article which really resonated with me - "It was a really difficult time in my life, and I think I've always coped with difficult times by going back to happier periods. I was in a phase when I just wanted to retreat, to be solitary and to reflect on better times." The reason I like what Clare says is that I am doing just that right now, going back to happier times. I love the 80s, I was a teenager with a perm, ribbon in my hair, blue eyeliner and a love for both John Taylor and Martin Kemp. I saw both Duran and Spandau in concert - oh the joy and breathlessness of being 10ft away from John Taylor when I went to see them at Wembley Arena and finding ourselves in the second row from the front. Screeeeam! I still remember my old fan club membership number - 762273. I'll be screeeeeaming again next week as I'm going to see Spandau Ballet at the O2 - I cannot bloody wait. Until next Tuesday arrives, I've been stalking following them on Twitter, checking out old Spandau videos and TV stuff on YouTube and listening to their music over and over in the car. If you use YouTube, you'll know it gives you lots of other options and suggestions for things to watch, most of which have been other 80s acts - T'Pau, Culture Club (Victims is so under-rated), early U2, Adam & The Ants (I'll never forget our English teacher playing the part of Prince Charming in the school Christmas entertainment), more Duran, Dexys, Depeche Mode, Ultravox and the list goes on. I've loved reminiscing and remembering good times in my life back then. The Bluebells came up the other day and that reminded me of the day I went to the filming of Top of the Pops. I can't remember who was number 1 but Frankie Goes to Hollywood were there, as was Neil with Hole in My Shoe and Echo & The Bunnymen. In turn, that reminds of good times at school, sleepovers with school friends - in fact I tweeted one old school friend with a "Do you remember....!" "Yes!" she replied. And you know what, we're going to meet up at Easter. Can't wait! When Steve Strange died a month ago, I played the Fade to Grey video on You Tube - my brother bought the single in 1980 and I played it endlessly. Missy loved it too although thought he looked weird. He did and that was the great thing about it! I then started Googling the top 50s from between 1977 and 1987 and I reckon I knew almost every single mentioned and had a memory relating to that single. Ahhhhh, those were the days. Who remembers waiting for the charts to be announced at 12.45pm on a Tuesday lunchtime? We used to sneak a transistor radio into the loos at school just so we could listen and I think we screamed quite loudly when True reached no. 1. Who couldn't wait for TOTP on a Thursday night? Next time I'm at my Mum's I need to search out my Duran scrapbooks and my videos on Live Aid - I videoed the whole thing! Luckily we still have a video player up in the loft so I'll be able to play them. 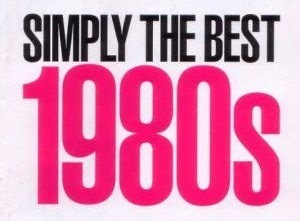 The point is .... going back to the 80s brings back very happy memories and that's a good thing. Missy is up and down - a few rocky weeks, then a few calm weeks, then back to weeks of grumpiness, regression and attention (attachment)-seeking, then calmness again. Currently we're in a rocky week. She's very Highly Strung (geddit?). Seriously, I'm getting motion-sickness from this rollercoaster. But the reflection on these happy times (or is that Reflex-ion - only a few probably will get that!) is bringing a smile to my face and on the whole I've felt pretty good since the beginning of the year which, following, my high anxiety last Autumn is most welcome. In other news, my Horticulture course is going well and I am loving being in the fresh air. And I've already passed several assessments. High five me! Right, I think I need an 80s fix. Cue YouTube.